Examples, solutions, videos, and worksheets to help Grade 8 students learn about co-interior angles (also called consecutive interior angles, same side interior angles). What is the Consecutive Interior Angles Theorem? What is the Alternate Interior Angles Theorem? The Consecutive Interior Angles Theorem states that if two parallel lines are cut by a transversal, then each pair of alternate interior angles is congruent. 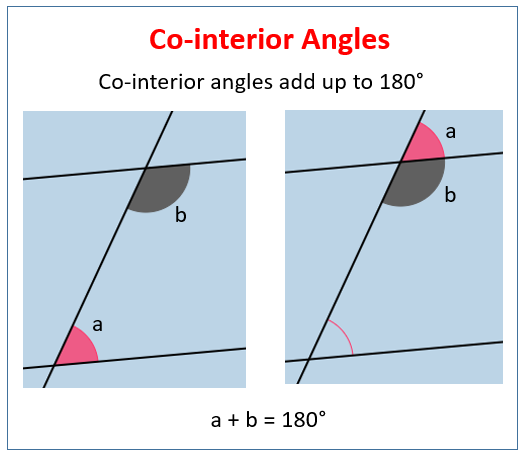 The following figures give the some examples of co-interior angles. Scroll down the page for more examples and solutions. How to use the Consecutive Interior Angles Theorem?